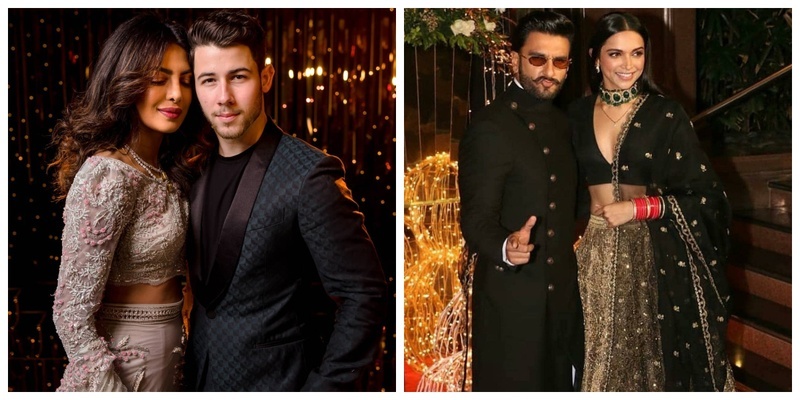 All the stars who attended Priyanka Chopra & Nick Jonas' Bollywood reception in Mumbai! All eyes were set on the Power couple - Priyanka Chopra and Nick Jonas’ final reception which took place at Mumbai’s Taj Landsend last night and it was exactly what I was hoping for and more! The evening had an impressive lineup of guests and was attended by all the the bigwigs of the entertainment world as well as several sports stars. From Salman Khan and Anushka Sharma to newlyweds Ranveer Singh and Deepika Padukone, everyone was there. Soon after guests started arriving, Priyanka and Nick made a stunning appearance at the venue and sent the paparazzi in a tizzy. Priyanka wore a stunning crop-top and high waisted Abu Jani Sandeep Khosla lehenga and looked stunning. This is what the designer had to say about it, “a custom tulle Spring Blossom skirt, hand embroidered with tiny, organza and chiffon flowers encrusted with crystals and bugle beads as accents." Nick on the other hand looked dapper in a bottle green suit. Loved the metallic work on her anarkali! They looked so so gorgeous twinning in black together! She definitely rose the temperatures high in this stunning saree styled with that cape! She never disappoints us, does she? Can’t stop adoring that gorgeous lehenga skirt! She def killed it in that green net saree with heavy work on it! Loving the offbeat choice of colour! Well, lets say some more effort would be more appreciated.. Kudos on carrying off that dashing red gown! He never gets old, does he?! The hottie and the charmer! Well, its difficult to take your eyes off DP, but the couple sure does look simple & cute as ever! And DP again with her gorgeous smile! Well well, here’s saying I sure am star-struck!